Vergnügte Ruh’, beliebte Seelenlust BWV170, Widerstehe doch der Sünde BWV54, Ich habe genug BWV82, Sinfonias from Cantatas BWV52 & 174. With an appropriate sense of timing, this CD was released on the day that it was announced that the distinguished countertenor Iestyn Davies was awarded an MBE in the Queen’s New Year’s honours list. For non-UK readers, this is the archaically entitled ‘Member of the Most Excellent Order of the British Empire’ and is awarded for ‘outstanding achievement’. There are at least four higher categories of ‘British Empire’ awards for him to look forward to. 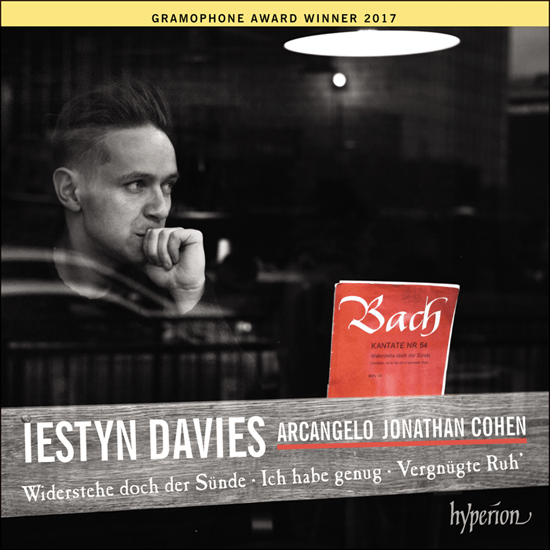 This is the third recording he has made with Arcangelo for Hyperion, but this one is very clearly a recording designed specifically to promote Iestyn Davies. His name is given stronger emphasis on the CD cover than the likes of Bach, let alone Arcangelo and Jonathan Cohen, all also pretty good musicians. As is so often the way with such recordings, balance favours his voice with far too much prominence over the orchestral accompaniments. This gives a very unrealistic idea how the music would sound in concert, never mind how it would sound in Bach’s day, when it was probably sung from a gallery in a church. The choice of music is also relatively predictable, with three of Bach’s most famous cantatas for the alto voice, composed between the ages of 30 and 45. But all three are outstanding examples of Bach’s cantata writing, and are often performed together in concert. For Bach, an alto was an pre-adolescent boy in the relatively short period of time after his voice began to lower, but before it broke. Boys voices broke much later in those days, so the age could have been 15-17 or so. With the training that boys choristers would have received, boy singers of that age would have been very experienced, and well able to express the complex emotions and musical twiddles that Bach throws their way. 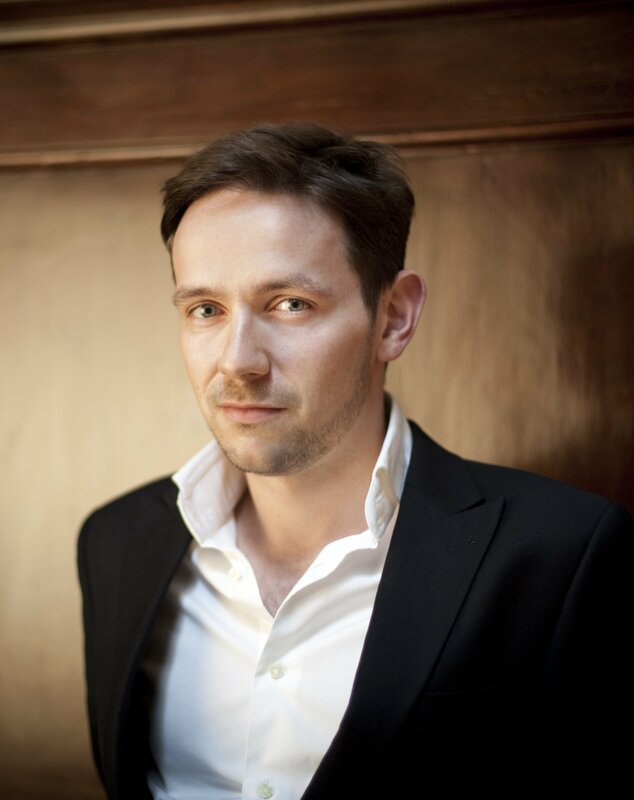 Iestyn Davies has the sort of countertenor voice that reflects the sound world of most boy altos, with his clear, clean and beautifully focussed timbre. ‘Boyish’ in other words, although he probably would not thank me for referring to it in that way. But it is a characteristic of one distinctive type of countertenor voice, the other being the overly wobbly take-off of an elderly operatic mezzo of the Hinge & Bracket variety which frankly makes me cringe. Although Davies does have a vibrato to his voice, he can control it beautifully, holding onto long notes with perfect clarity before gently dissolving into a gentle vibrato – a key technique of baroque singers but one that many never manage to achieve. He also has an extraordinary vocal range, delving down to the depths of the countertenor range without ever breaking into a tenor register, as so many have to do when going low. That it particularly noticeable in the low-set Widerstehe doch der Sünde, but also at times in Ich habe genug. Of course, a boy alto would have no tenor register to break into, so that adds to the authenticity of Davies’s voice for this repertoire. Although he clearly walks on countertenor water and for many people would be above reproach, I will mention an occasional tendency to lift onto notes, rather than landing securely on pitch. He is far from alone in this, but once he gets to the note, he clings to it superbly as far as intonation is concerned. That slight criticism is more than balanced by the beauty of his tone and his ability to negotiate the most complex of Bach’s musical lines with apparent ease. His ability to ornament, including proper trills, is exemplary. I have seen and reviewed Iestyn Davies many times, but have never seen him looking anything like the bizarre photograph on the CD cover. For the purposes of this CD cover, he is portrayed as coming over all Nige (a reference to the ‘down with the lads’ image that violinist Nigel Kennedy sports), with spiky punk-Mohecan hair atop a reflectively moody pose. I am really not sure who this is intended to appeal to, but I guess the Hyperion PR people have a particular audience in mind, even if it is not me. To me, it just makes him look like a rather awkward adolescent, rather than one of the finest English singers around today. It is certainly not an image that would encourage me to buy a CD. He normally looks more like this photo. As is so often the case with Bach cantatas, it is sometime better to ignore the texts, many of which have sentiments which seem rather at odds with the music and, indeed, with most generally accepted religious thinking of the present day. Rather like a lot of opera, it is sometimes better to just let the music flow. Iestyn Davies doesn’t really delve emotionally into spiritual depths. The instrumentalists are worthy of mention, with characteristically eloquent oboe playing from Katharine Spreckelsen and some crisp and nifty fingerwork from organist Mark Williams.